Made from soft acrylic and fleece lining, this knitted beanie hat and scarf are lined with thick fleece lining. 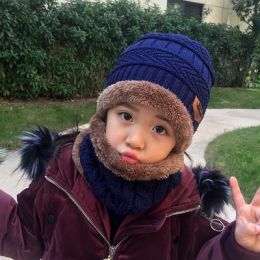 It can protect your kids head, ears, face and neck from the cold wind, extremely warm and cozy. It is very charming and stylish, great for casual daily wear and outdoor sports and activities. High quality Material- Made of thicker knitting wool, soft, comfortable and warm. Soft Fleece Lining- Better heat retention, just enjoy the maximum warmth. Delicate Sewing Thread- Providing added durability. Stretchy & Elastic- Suitable for kids of 4-14 years old. One size fits for all. 2-in-1 Winter Accessories - You can use this multi-function beanie hat and scarf set together or separately as you will. It will keep your head, ears, face and neck warm. Stay warm all the time, great for outdoor activities and daily warmer. We also have this hat and scarf sets for adults in our store. Note: Please allow little color difference due to the monitor and light brightness.